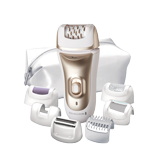 i-LIGHT® PRO+ Face & Body IPL Permanent Hair Removal is rated 4.2 out of 5 by 180. 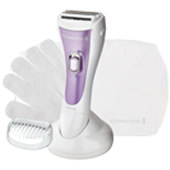 Get ready for the next generation of hair removal with the Remington i-LIGHT® Pro+ Face & Body – fast, effective and gentle on the skin, this Intense Pulse Light (IPL) system offers a permanent* and completely comfortable solution to remove unwanted hair in the comfort and privacy of your own home. 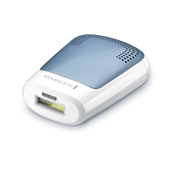 The i-LIGHT® Pro+ Face & Body features advanced technology that sets it apart from other at-home IPL devices. High energy output (7-8J/cm²) effectively disables the hair follicle with ProPulse™ wavelengths (>600nm) which deeply penetrate the skin to reach right down to the hair root. The light energy is delivered in long pulse durations (110ms) – faster than a blink of an eye - that are gentle to the skin. These three factors combined are the perfect recipe for safe & effective permanent hair removal in as little as 4 weeks*. Now you can feel confident and ready for anything all year round with soft, smooth, hair-free skin. *Individual results vary. In clinical testing on the body, the upper quartile of treatment sites averaged 94.3% fewer hairs after just three treatments. On average, participants in that study had 66% fewer hairs 12 months after just three treatments. Rated 5 out of 5 by Kayjw from Good size My Frist time today useing my Remington Easy to use, Light weight. Rated 5 out of 5 by Bim85 from Easy to Use with Great Results It is a terrifying prospect to actually 'shave' an area of concern, particularly when it is on your face (upper lip) because doesn't hair grow back coarse and seemingly thicker and darker because of that blunt cut? These were my thoughts when I started using the i-Light Pro. To be honest, I have used another IPL system in the past - but it was so bulky and awkward to use that I failed to keep up the required program, though I was seeing results. I purchased the i-Light Pro out of sheer desperation, and I loved the colour of the unit - shallow, I know - and it has been a blessing. The i-Light Pro is just so simple to set up, and with just one touch of the sensor panel to your skin, you are ready to go! The handheld IPL head sits nicely in the hand and is easy to move around those tight bends and folds on the body. There is a facial attachment for dealing with the smaller areas on the mush (upper and lower lip, chin, etc.) with total ease. 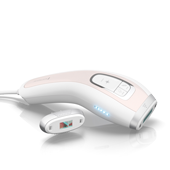 I have always used the unit at its highest setting, and have never felt any pain or discomfort, just the occasional waft of burnt hair after treatment...and yes, the i-Light Pro works an absolute treat! Any hair that does grow back, grows back so much finer and lighter until it disappears all together after several treatments. I use my unit for the occasional touch up now - though I am now contemplating treating the dreaded armpits too :) A wonderful device from Remington which is so easy and convenient to use. It also stores neatly when not in use. I cannot recommend the i-Light Pro enough! Rated 5 out of 5 by Sharni from Easy to use! I brought this ages ago and i love it! I need to use it more often to see results but it is really easy to use. Having the face attachment is fantastic. It's not painful at all i put it on the highest setting every time! After i brought one my mother did and now my sister wants one. I tried lazer by the professional and this is better, quicker, and much cheaper! Rated 5 out of 5 by DianaKiss from Love the results! Virtually painfree hair removal! I bought this 6 months ago to help with all the extra hair that comes with having PCOS, and it's doing wonders! It's saved me quite a lot of time and money so I'm very happy. Rated 5 out of 5 by Mimi6464 from It actually works! I bought the i-Light Pro a year ago as I had heard great things about it from a popular blogger. I was a bit nervous to use it as I was worried about how safe it is - it is a laser device after all! I was so pleasantly surprised to find it easy to use as well as low on pain. I set it to the lowest strength and found that I only felt a very light burst of heat. I had read that you need to persevere to see results so I wasn't expecting to be hair free right away. However, after several uses I found that I actually have hair free patches on my legs! I have pale skin and dark hair so the lower setting is ideal for me. I am so pleased that I bought the i-Light Pro and have found that it is better value and more convenient than salon visits. I also love that I don't need to shave every day anymore. *Individual results vary. In clinical trials on the body, treatment sites showed up to 94.3% fewer hairs twelve months after just 4 weeks of treatment (3 treatments each 2 weeks apart). Similar results observed from professional hair removal devices. Experience fast & effective permanent hair removal in 15minutes. Stay silky smooth and hair-free wherever you travel. 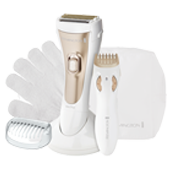 For the ultimate trim, shape & shave experience while leaving your skin nourished. Experience the benefits of silky-smooth skin. High performance epilation delivers fast & efficient hair removal straight from the root.